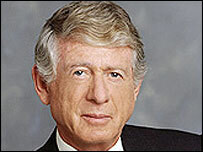 Leading US journalist Ted Koppel, who has presented ABC's Nightline news show for the last 25 years, is due to leave his post at the station in December. Mr Koppel was offered other work at the network after his contract expired but he chose to retire, ABC said. The presenter's departure comes as US television stations face heavy pressure from the internet and cable channels. His departure follows that of Tom Brokaw from NBC Nightly News and Dan Rather from CBS after 24 years. "As much as I will regret his leaving, he is firm in his conviction, and I respect his decision," ABC News President David Westin said. ABC's main anchor Peter Jennings is the only one of the top network anchors of the last two decades who retains his job. Mr Koppel's Nightline became well known following its coverage of the Iran hostage crisis that began in November 1979 when the US Embassy in Tehran was stormed and dozens of Americans were taken hostage. He was criticised recently after he dedicated an edition of Nightline to broadcasting the names and pictures of soldiers killed in Iraq, which was described by some as anti-war propaganda. The programme was screened on the eve of the anniversary of President George W Bush's 1 May 2003 statement that major combat in Iraq was over. Mr Koppel, 65, has worked at ABC for 42 years.